It is surprising the places a letter can take you! De Jong was a meticulous collector. Along with books and offprints, everything that entered or left his house and offices was kept and documented. His correspondence was no exception. De Jong ensured that copies were made of letters he sent, and those copies, along with their original replies, were retained and stored together. 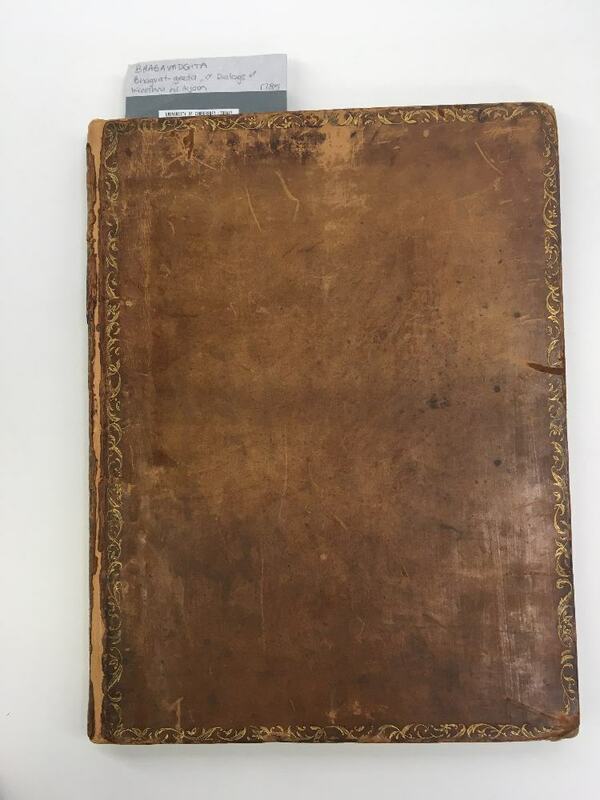 They can now be found in the University of Canterbury De Jong collection, organised in chronological order in large ring binders. The binders read like intertwined episodes of unfolding interactions and testify to both De Jong’s every day work as well as some more unusual requests and interactions. They thus offer a fascinating backdrop to the more public activities undertaken throughout this scholar’s career. These binders caught my eye one day as I was browsing through the collections, and with a morning to spare, I curled up in the corner of the Macmillan Brown library and started reading from the beginning. 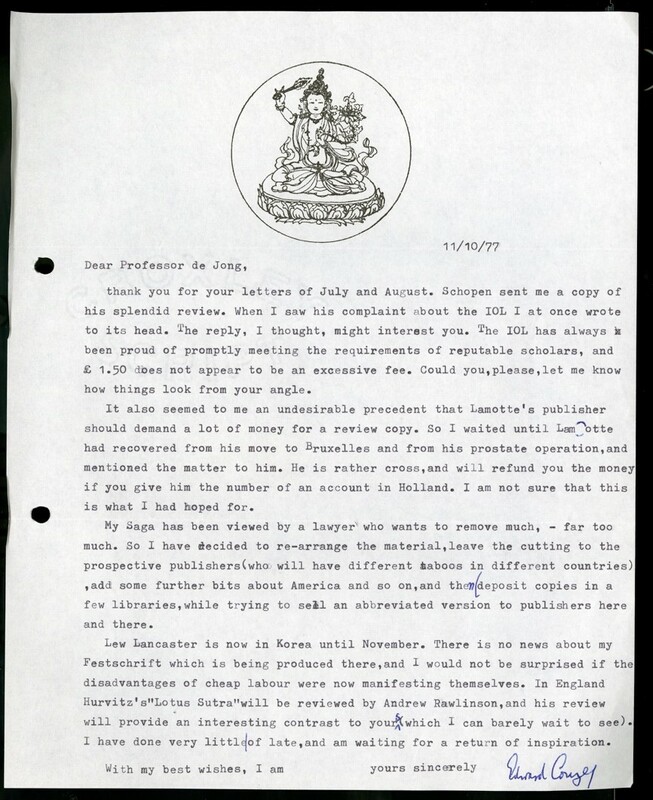 At a certain point, my eye fell upon a letter dated 12 July 1983, partly because of the distinctive University of Canterbury Letterhead at the top, and partly because the word ‘Sanskrit Manuscript’ jumped out at me. I paused and read the letter carefully [See Figure One]. 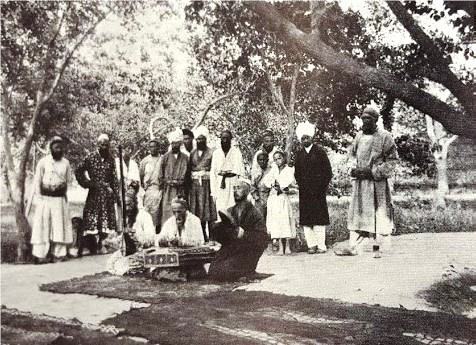 The letter was from R. W. Hlavac, the then University Librarian, writing to De Jong asking for expert information on an artefact the university library had just acquired as part of the Albert William Andrews collection, namely an 18th century Sanskrit astrological scroll which was between 6 and 7 meters long. 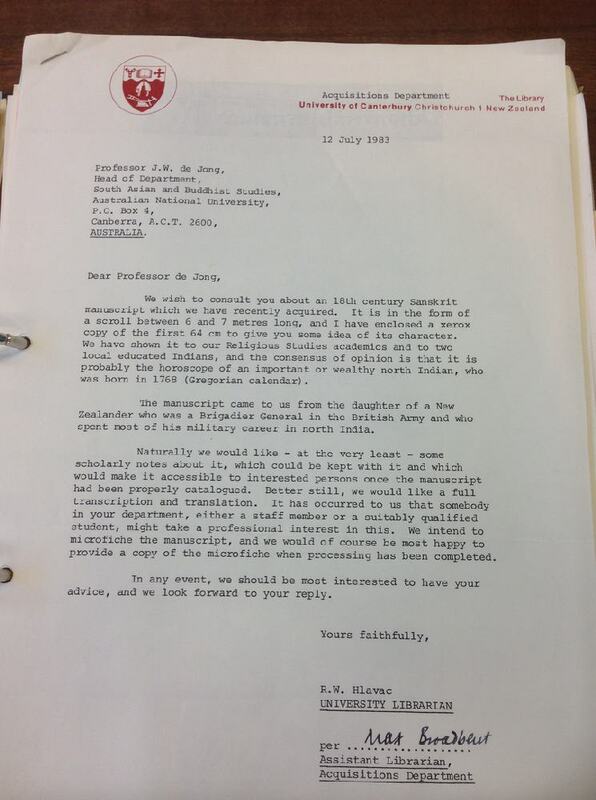 De Jong’s reply, composed on the 16th of August, suggested it should be a project for a suitably qualified student and the correspondence on this between the two appears to have stopped there. I was intrigued. Where was this manuscript? Did the library still have it? Furthermore, my mind was boggling at the dimensions of this scroll. Seven meters? In all my dealings with manuscripts, I’d never heard of scroll of such size before! Clearly this was a very special item in the library collection, but nobody seemed to know anything about it. I was determined to get to the bottom of this. MB 680 Albert William Andrews papers : Sanskrit Scroll. Horoscope. Circa 18th century. Description: 1 scroll ; 17 cm. wide, kept in box. 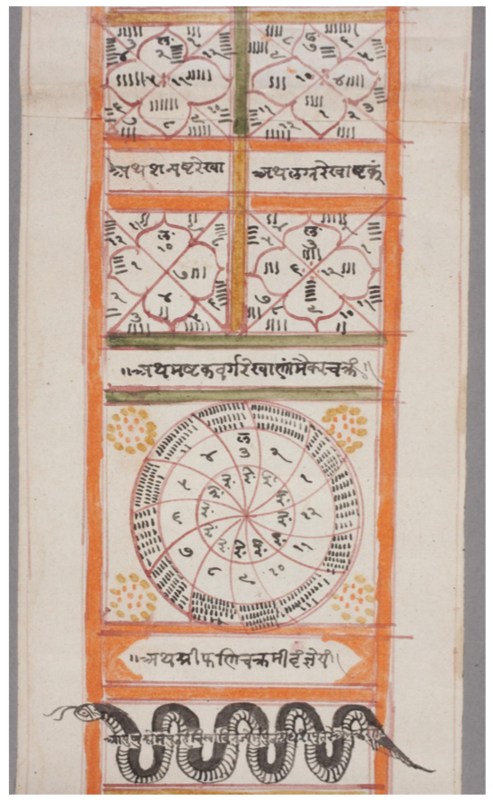 Notes: The handwritten and illustrated paper scroll is thought to be a personal horoscope dating from the late 18th century. A horoscope is a special sort of astrological document. Based on the birthdate of an individual, astrologers would compute the positions of the sun, moon, and planets, and using these, would predict key events in the life of the individual. While the basis of astrological forecasts are not strictly scientific, the methods astrologers used to compute planetary positions and related phenomena are of great interest to historians of astronomy, as they give us direct insight into the techniques and mathematical models astronomers used to predict celestial events. 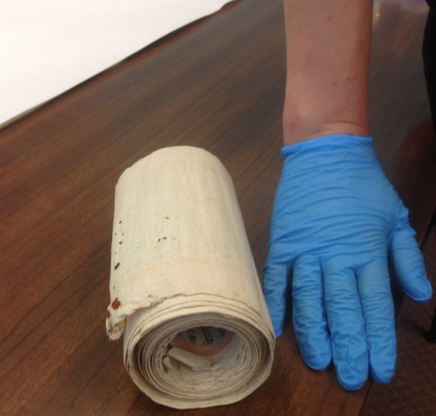 While the scroll was very long, it was quite narrow, no more than 20cm and it was stored rolled up. The scroll appears to have been made up of many smaller sheets pasted together. Unfortunately, the first sheet appears to have become detached at some point and is no longer part of the original. 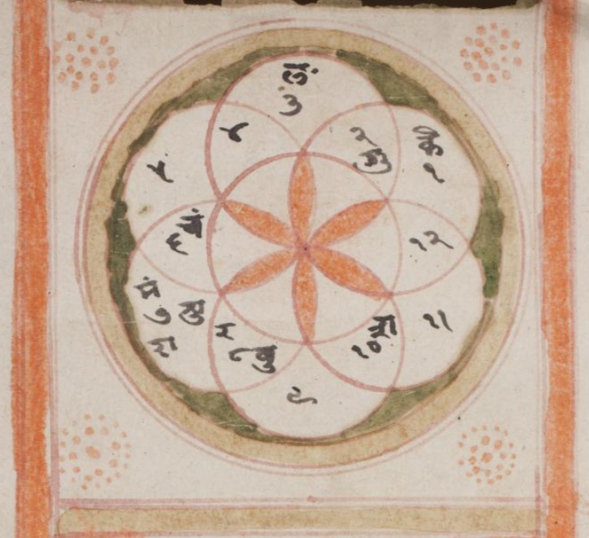 This means that the beginning of the text is gone, so that any information about the name and circumstances of the individual for whom this horoscope was cast is lost, details which are central to a horoscope. However, by a stroke of luck, when the text does pick up, it starts with the precise date and circumstances of the birth of this individual. 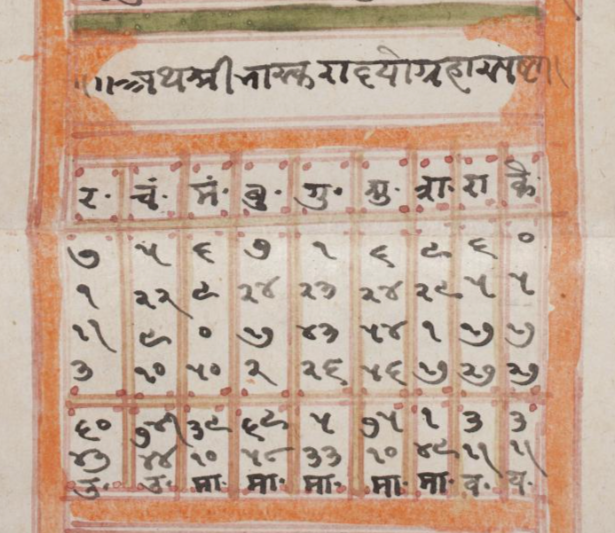 The date, using various traditional eras, is given as: “saṃvat 1903, śaka 1768, winter, month of Kārttika, the dark fortnight, 12th tithi, 48th ghaṭī, 49th pala, Sunday”. This is a very exact date, and corresponds to Sunday, November 15th, 1846, 19 hours, 31 minutes, and 36 seconds after sunrise. This sort of precision is typical of a horoscope! Here the first letter abbreviations of each of the planets are placed in one of the twelve partitions of the rosette, which are labelled 1 through to 12 anticlockwise, one for each of the twelve zodiacal signs. With this key information computed, the astrological interpretation can begin! It is hard to estimate the significance of the scroll. One assumes that such documents cannot be all that rare as these are the products of a working astrologer. However, given the length and detail of this particular document, I suggest this was quite a special text! Perhaps there might be a clue in the Andrews papers that might reveal the name of the individual for whom the horoscope was cast as well. Without De Jong’s letter, the scroll could very well be still sitting on the shelf. 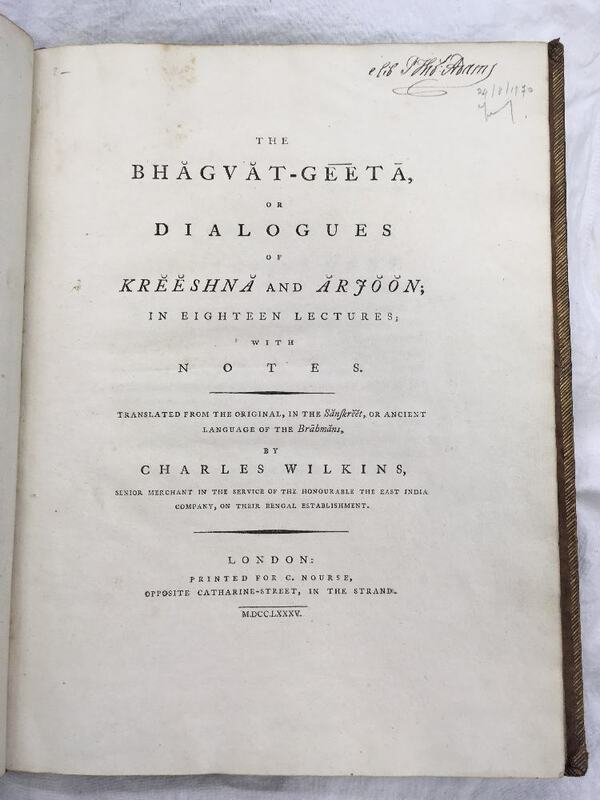 However, as he recommended, I will be making sure that this text gets transcribed and translated, and eventually published, so that it adds to our understanding of this corpus of documents in Indian history.